How to get dog pee smell out of carpet - fast! In the current article we’ll discuss the problem which many dog owners face, especially when their dogs are just puppies or juveniles – they often pee on carpets. How to deal with this matter? How to get dog pee smell out of carpet by lots of various means? How to train your dog to pee outside? Quite often appearance of a dog in a house comes with another issue – some unusual smells appear (hair of some dog breeds has specific smell). Also if the dog is young and untrained, its owner has one more problem – the dog pees all over the house and on carpets as well. Dog pee smell is quite long-lasting one and the “marked” carpet will also stay smelly for a long time. That’s why it is always important to remove the stain and the pee odor as fast as possible, before the puddle dries and the carpet absorbs the smell. 2 What are the ways of cleaning carpets from dog pee? 3 What will you need to clean a carpet from dog urine stains and odor? Once your dog peed on a carpet try to remove the stain as fast as possible. Because when it gets dry all standard means won’t help. Use paper towels. They perfectly absorb liquid and you can throw them away. 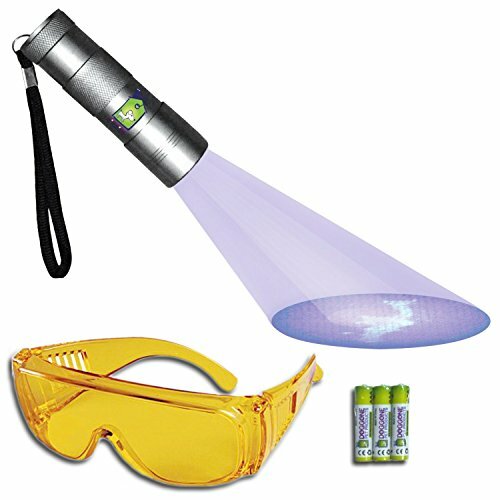 If you can smell dog urine odor, but you can’t see the source use a special flash-light. It will illuminate dry urine spots and you’ll find many new sources of the smell. The simplest mixture you can use to clean fresh urine stain is vinegar and soda. Add vinegar into water in the ratio of 1 to 3 and apply it on the urine stain. Then give about 15-20 minutes for the substance to act. Then sprinkle some soda on it – it’ll absorb the odor and liquid. Remove the soda with vacuum cleaner. Don’t use a robot vacuum cleaner for this purpose. Once again, keep in mind that applying some aggressive substances (chlorine, household chemicals) may ruin a carpet, make it colorless or burn a hole in it. However, it is acceptable to use alcohol or vodka. To remove old urine stains you should use specialized enzymatic cleaners. Train you dog to pee outside. You’ll find tips how to do this at the end of this article. What are the ways of cleaning carpets from dog pee? In this article we presented the most common and safe methods of cleaning carpets and removing odors from them. These are substances you may have at hand at home and specialized time proved means. While reading lots of forums and sites you may find advice to use iodine and manganese solutions, hydrogen peroxide and chlorine (or chlorine containing cleaning substances) to clean carpets from dog pee. However, it’s better not to apply these substances since they may ruin your carpets (color them or vice versa – create some colorless spots). When talking about materials on hand you may use, it’s worth considering soda bicarbonate and vinegar. Applying these substances will help not only to get rid of stains and odor of dog pee, but there are high chances that they won’t damage carpets and won’t leave colorless spots on them. To remove old stains and dog pee odor it’s recommended to use specialized cleaning means, created just for this purpose. They were made for various kinds of carpets and they contain safe and efficient chemicals capable not only to clean carpets from dog pee but also to neutralize its odor. What will you need to clean a carpet from dog urine stains and odor? Washing and cleaning products (something you have at hand or specialized chemicals). Clean water of room temperature. Wet and dry vacuum cleaner (it isn’t a must, but it may simplify the cleaning process). Rubber gloves (to protect your hands from action of cleaning products). Not all carpets can be subjected to cleaning at home (for example, carpets made of viscose rayon, silk and almost all hand made ones). Don’t rub the stains with the cloth, sponge or brush – you may ruin the carpet fabric and make the stain larger (you should clean it from its edges to center). Don’t moisture the carpet too much while cleaning it and make sure that it gets completely dry after this, because if not, the carpet may later have mildew which produces bacteria and again the carpet becomes smelly. All cleaning and washing substances must be tested on a small spot of the carpet to make sure that they will not ruin the carpet structure and colors. When applying store-bought cleaning products always read attentively the package instructions and follow them closely. Ventilate the room well while cleaning the carpet and after you have finished. Which approach and cleaning substances to use depends on whether the dog urine stain is old or not. So further we’ll discuss this issue separately for each case. This is the most efficient way just because these cleaners were designed and aimed to clean urine spots from carpets or floors. Apply the special cleaner on a stain (it is desirable to buy one right when the dog appears in the house). Follow the package instructions (each specialized cleaner has its own order of cleaning process developed by its manufactures). After you finish cleaning dry the carpet and enjoy it without stains and odor. Vinegar and washing soda. This is the most common way of removing not only carpet stains, but also dog, cat and other urine smell. Mix vinegar and water in the ratio of (1:3) and apply it (with a sponge or sprayer) on the dog urine stain. Wait for a while (15-20 min) till it sinks and starts reacting with dog urine. When the stain gets dry sprinkle it with soda and wait till the carpet dries completely. In the end clean the whole carpet with a vacuum cleaner (pay special attention to the place where the stain was). Keep in mind that robot vacuum cleaners (like Roomba 650 or Roborock S50) won’t do for this purpose, since it has very low sucking power. Alcohol. Process wet urine stain with alcohol solution (1:1) or with vodka, wait for about 10 minutes and wipe the stain thoroughly with dry clean cloth to remove the moisture and dry the carpet. It is difficult to get old pee stains out of surfaces, since they sink into the carpet completely. Therefore, to get rid of old dog urine stains it’s better to use only quality specialized chemical cleaners. Follow the package instructions closely and repeat the cleaning process several times to ensure cleaning efficiency. Recently this black colored lamp has appeared on sale. The ultraviolet light that it irradiates will help you to find any dry cat urine stains, which you can’t see without it. Your pet’s urine stains will become yellow in the UV light of the lamp. It costs very little, but it is extremely useful. You’ll be able to find the spots you didn’t even suspect about and you’ll get rid of cat urine spraying as well. You won’t need to snuff any more. Widely advertised and surprisingly effective stuff to fight with cat urine smell. It is not toxic both for human and animals. It quickly penetrates into the surface being processed and prevents from new marks appearing at the same place. One of the most popular enzymatic cleaners that you can buy on Amazon.com. The substance has perfect reviews and high rating. Many enzymatic cleaners are said to be multi-purpose ones, while there are very few cleaners that are really efficient. 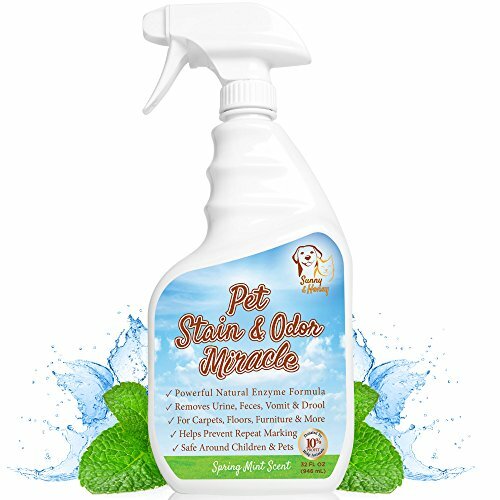 Miracle Pet Stain & Odor Remover doesn’t just eliminate the stain and the smell completely, it is very delicate to surfaces as well, which is of no little interest. Here are the survivors of our experiment – a leather bag (which my friend was about to throw away), a sofa, a futon, running shoes, a parquet floor and a carpet. What I want to say is that this substance removes the odor perfectly. Those who think that you can never get rid of ammonia smell I do recommend to try this cleaner and think it over again. This cleaner perfectly deals with cat urine smell as well as with the smell where the cat got sick while getting rid of the fur it got inside while washing itself. Another excellent odor eliminator. It is completely safe and a multi-purpose one (it suits both cats and dogs). 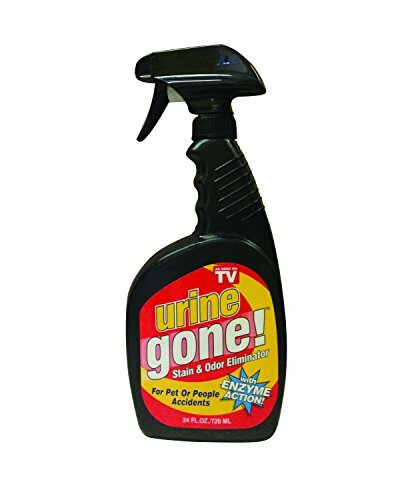 It is easy to use: you take all animals and kids out of the room where you plan to use the substance, check if it is safe for surfaces (by the way my sofa and carpet are still OK) and spray the substance on the cat urine stain. As for me, I also rubbed the substance with a sponge. And that’s it! After surfaces or things get dry you can use them. If it is necessary repeat the procedure and no odor will be left at all. 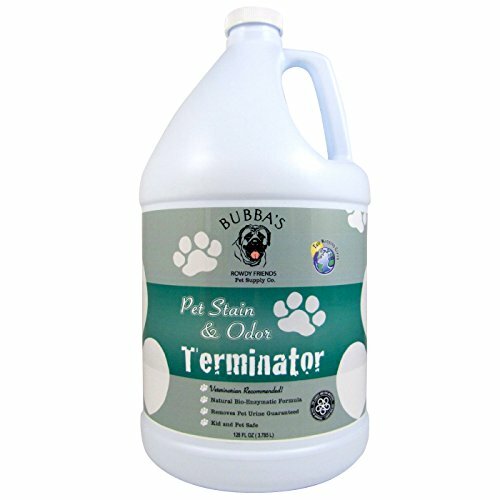 A very good odor eliminator both for cats and dogs urine. Another advantage is that it is sold in a large volume bottle. If you see you dog peeing in the house, stop it immediately. Say: “Stop!”. Be firm and strict, but don’t shout! The dog has to know that you love it, but it behaves wrong. Take a dog-lead and take the dog outside. Continue walking till the dog pees. Don’t limit the time of your walk. Try to stay outside till your pet finally does the deed. If you’ve noticed that the dog started walking and sniffing around, this is the signal that the dog has to pee. Command something positive to the dog, for example, “let’s go out!” and take the pet outside to let him pee. While you are teaching the dog it’s important to have it in sight all the time. Especially, if it hasn’t peed for a long time. Otherwise, you may see another puddle on the floor. You should give the same command to the dog, when you are outside and see that the pet has to pee (“do your deed” for example). If the dog still hasn’t done it, than put it into a crate and a few minutes later get it outside again. If you don’t have a crate, then just take longer walks. When the dog has followed your order and peed, don’t forget to praise it. Stroke it and give some treat. Your pet has to understand that you feel grateful because it follows your orders. So praise the dog only after it obeys the order, i.e. when it pees outside. Get a special spray with a smell that scares animals away. Spray it on furniture and the spots where the dog tries to pee in the house. The smell will scare the pet away from the forbidden places. If you don’t do this there will still be the chance that the dog pees in the house again. Also apply the spray outside where often other animals pee. As we’ve already mentioned, think of an order that you’ll give to the dog when it’s time to pee. It can be any of these “go pee”, “let’s go out”, “do your deed” or anything you can think of. Praise the dog and give it a treat each time it obeys and pees outside. In several weeks you’ll have a pleasant surprise – your dog will follow your order and pee only outside. Praise and reward is a must when training a dog to pee outside. Each time you take the dog for a walk take a treat with you to praise the pet when it does everything right. Remember, that during the training process you can’t take the dog back to the house, if it hasn’t done its deed during the walk. It is better to walk for some time more and wait till your pet finally pees.